Thank you, and thank you for the opportunity to answer your questions, I'm so honored! This was the 12th edition of the international festival "Days of Percussion" of the Percussive Arts Society Italy, with Artistic Director and President Antonio Santangelo and it was held in "Serena Majestic", Montesilvano, Pescara, Italy. This is one of the biggest international percussion forums, the candidates were 280 and they arrived from 34 countries! The very important part for success of this musical event had the organizers - Mr. Antonio Santangelo, Santangelo's family and their friends who organized everything so perfect. The competition included composition and five groups of percussion - marimba, vibraphone, timpani, snare drum and drumset. The juries were precisely selected and invited from all around the world - some of the most famous composers and performers of the highest class. You know the names of Emmanuel Sejourne, Eriko Daimo, Pius Cheung, Casey Cangelosi, David Friedman, Ruud Wiener, Zoro, Urs Wiesner, Jean-Francois Leze, Ignacio Ceballos Martin, Liu Heng and Playmobeat. Besides the competition there were concerts of the members of the juries as well as master classes. If you have time I recommend you to go there next year. It's an amazing forum with so many people and every second person is a percussionist, so you can share your experiences and make new friends and connections. For me, I decided to participate with the Marimba, because this is my favorite of all percussion instruments. There were three groups in the category "Marimba", from young players to older - A, B, C and the interesting thing was that I was too young for the highest group of competing (group C). I specially wrote a letter to Mr. Santangelo to accept my documents for group C instead of group B. The answer was - "If you are well prepared, there is no problem", so I thank him so much for this opportunity to compete with some of the best players in the marimba world. I have been there for a week, and like in every big competition the stress was in high doses until the end. I guess part of my success goes to my preparation, which was 8 hours of practicing every single day during the whole summer and my psychics, because if you are well prepared with the material, there is the bad chance when you go on the stage in front of these world class professionalists to compete with other such great performers, to have a bad day and this bad day to reflect on your playing. The right concentration is very important in the competitions. After playing in the final round which was a recital of up to 25 minutes and we were only 4 performers who got to this stage I played: Johann Sebastian Bach "Cello suite 1 - prelude"; Domenico Scarlatti "Sonata K 98" for harpsichord; Andrew Thomas "Merlin for solo Marimba"; Kiril Stoyanov "Madrigal and Horo" (I wanted to finish my playing with something from my beautiful country - Bulgaria, nowhere in the world you can hear this "healing" melodies and measures so I thought that this was the right moment to show our traditional folklore music). I was so happy when I saw my name with 95/100 points - first prize awarded plus the prize of the amazing instruments from Bergerault! This is my first prize in a European Union competition! During the same day there was a concert of the winners including 14 finalists with first prizes in each section of the competition. My performance was Domenico Scarlatti "Sonata K 98" and it was greeted with a storm of applause. The last decade shows that so many young percussionists play more and more Marimba. What is the motivation to play such an instrument and what are the perspectives for a Marimba player? For me playing the marimba is something special because you are not only making the rhythm which is typical for our percussion instruments, you make the melodic line, you can express yourself, your feelings through the music in a unique way with the mallets. The instrument has so many qualities and can give you so many different ways to make and hear the notes through the playing. Rich of sound colors and overtones, powerful, I am sure that in 10-15 years the instrument will be one of the well know and maybe in the top of solo classical instruments in the world. On the other hand there is the virtuosity of the instrument. Every person who is not a musician (and of course not only), watching the performance of a good marimba player is totally impressed from the way of playing with the mallets and from the sound which is so powerful and in other ways so delicate, enveloping the body with so different sound vibrations. Exactly for this and for many more things which you will see and feel when you see and hear the marimba live, will answer why there are so many young percussionists who desire to play more and more this instrument. To succeed only with marimba at this moment is a very hard task, as well as to succeed with any classical instrument only as soloist, but I think that if you desire it truly and work hard, everything in this life is possible. With your Scarlatti performances in the social networks you impressed even the most famous Marimbists? Why Scarlatti? Why are you performing the old masters? Domenico Scarlatti is one of the greatest and most famous composers of the Baroque. His pieces are with high emotions, virtuous phrases, clear vibrations and positive eradiations. His music was influential in the development of the Classical Style and he composed in a variety of musical forms, but he is well known in our time mainly for his 555 harpsichord sonatas. I am enjoying so much his style of composing, the fast tempos and the strong energy which you can feel when you play his works. For me, as a musician who is willing to experiment and willing to reinvent new ways of self-expression through my favorite instrument, new sound colors, I decided that my initiative needs to start from the beginning, from the purest and crystal music for me - the Baroque era. The structure of the bars of the marimba is very similar to that of keyboard instruments, and therefore, my first attempts were to transcribe and perform the harpsichord sonatas from one of my favorite authors - Domenico Scarlatti. The biggest difficulty was the performance in the tempo the composer requested. A pianist has 10 fingers and we marimbists are limited to only four mallets. Of course, there are techniques to perform with six mallets, but they do not offer the necessary control and speed for this type of music. After many hours of work the result was successful and amazing. Virtuosity in the performance, the crystal and gentle sound of the marimba and the perfection of the compositions of the Baroque, it would impress anyone. My opinion is that if the marimba in the form we know today existed in the Baroque era, it would be an instrument of great interest from almost all composers. For this reason, I continue to perform and make adaptations plus transcriptions of the Baroque: A. Vivaldi - Summer from the Four Seasons Violin Concertos, J.S. Bach - Harpsichord Concerto No.1 in D minor, J.S. Bach's Fugue in G minor, a brand new transcription with new orchestration from A. Vivaldi - La Folia and many others. You come from Bulgaria. What part does the Marimba take in the musical and percussion life there? I come from Bulgaria, Orpheus country! Our traditional music is very rich in rhythms and movements, lyrical and dramatic as well as our beautiful nature. In the past the main engine of developing the percussion culture in Bulgaria was Prof. Dobri Paliev. As a founder he created the tradition in all areas of percussive arts in our country, every young artist here and in many parts of the world begins and continues his education through the exercises and notes of Prof. Paliev. This is the most reliable method for the proper construction of a professional percussionist. In recent years Prof. Tatiana Karparova is head of the percussion department in the National Academy of Music in Sofia. I am very grateful and happy to learn and grow under the teachings of Prof. Karparova and that I can share all my creative ideas. The contribution to my success at the competition in Italy I give to my professor. Globally there is a huge interest for the marimba playing as more and more young artists start to practice and perform. This trend and great desire for self-expression through melody and percussion can be seen in Bulgaria, too. The teachers in classes of percussion in the music schools at Sofia, Pleven, Varna, Plovdiv, Bourgas, Stara Zagora and Rousse prepare their students so well that already in adulthood they are becoming real professionalists handling skillfully numerous of percussion instruments. Most of them are so sufficiently well prepared that they can continue their education in the most prestigious universities in the world. With its overwhelming expression of sound and vision that lives in us, the marimba will arouse bigger and bigger interest, both for the performers of percussion instruments as well as for the people who have nothing to do with classical music. Bulgarian marimbists and performers who have reached the heights of percussion arts and are worldwide famous, working in the most elite orchestras and universities as well as performing as soloists - Alexander Kamenarov, Georgi Varbanov, Svet Stoyanov, Vassilena Serafimova, Vladimir Petrov, Tatiana Koleva, Kiril Stoyanov, Evgeniya Kavaldzhieva and many more. I want to thank Kiril Stoyanov, because he agreed to give me one of his compositions for my final piece of my recital in the 12th Italy Percussion Competition, 2014 - of course our amazing music from the folklore, Bulgarian Dances - "Madrigal and Horo", extraordinary piece which everyone in the audience enjoyed so much. Would you share your future plans with us? I would love to introduce my ideas and plans. The Baroque music is the base of many modern performances. I'm PhD student in the percussion class of Prof. Tatiana Karparova at the National Music Academy "Prof. Pantcho Vladigerov" with Rector Prof. Dimitar Momchilov in Sofia, Bulgaria. I include in my PhD work as a main theme - the possibilities, interpretations and transcriptions of baroque compositions with percussion mallet instruments. I perform and I like to arrange some of the most melodic and important pieces of the old masters A. Vivaldi, D. Scarlatti, J. Pachelbel, J. S. Bach, etc. 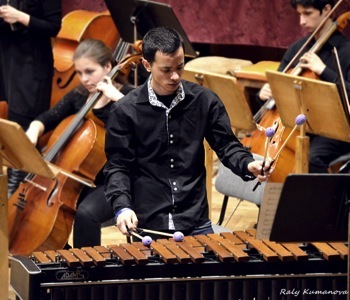 Two years ago I presented the world premiere of Antonio Vivaldi's concerto - Summer from the Four Seasons, which I transcripted for marimba and vibraphone and mainly for this reason as well as for the other concerts and works I introduced I was awarded the "Student of 2012" prize in my country Bulgaria in the whole section of culture. My last project of transcribing was the concert from A. Vivaldi - La Folia which I adapted for solo marimba, pipe organ and string chamber orchestra. I worked in a collaboration with a very talented young composer here in Bulgaria, Emelina Gorcheva, and the world premiere was held in the National Academy of Music, Sofia. I will be happy if some conductors or composers would like to work together and share our experiences in the big and amazing world of our percussion family.